NOTE: I first wrote this post several years ago. It has become my tradition to re-post it for Holy Week each year. I hope you enjoy it! The feast of the Annunciation fell on a Sunday this year. (March 25) In the Catholic church, its a Holy Day regardless of the day of the week it falls on. But my family, being Lutheran, weren’t so familiar with this feast day as I am. So we had some discussion about holidays and Holy Days of the church year. As I sat in the pew that morning, I was taken back to another time in my artistic life when I experienced this juxtaposition. I told this story several years ago, but I’ve revised it to share here again. 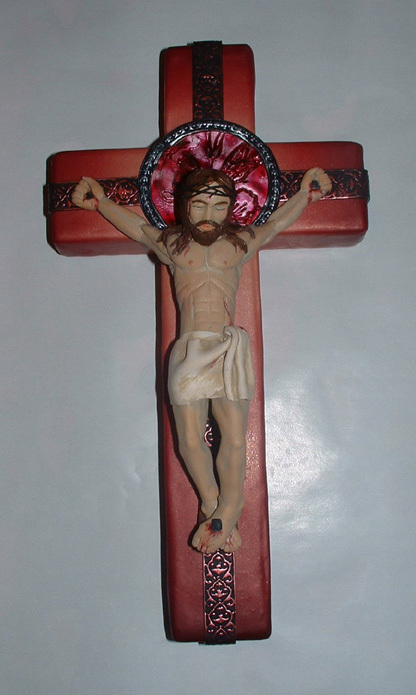 Six years ago, for Christmas, I sculpted crucifixes from polymer clay for each of my 3 kids. For about 2 weeks, I worked on them a few hours each day while they were in school. I made sure to put them away by 3:00 to keep them secret. I had made one several years before that hangs in my foyer, and my younger son touched my heart when he looked at it one morning and asked if he could have one in his room. Anyway, making the three together and spending so much time on them was a very moving experience for me. I felt disoriented about the time of year I was in. It was Advent, anticipating Christmas, I was shopping and baking, and all the usual. 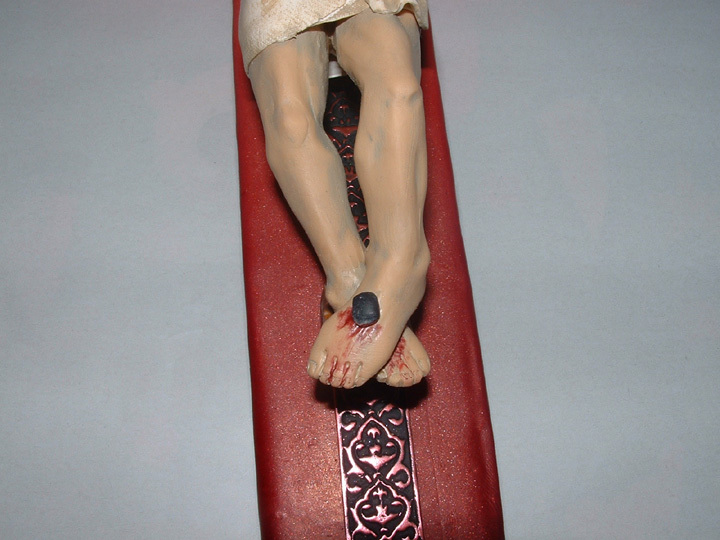 But for several hours each day, I was spending my time meditating on Christ’s passion. I recalled everything I’d ever heard about the physical and medical horror in understanding of what happened to a crucified human body. As I was working, I would think about the weight of a suffocating torso straining against the tendons of the arms as I tried to sculpt that. I looked at illustrations of muscles on line, held my own arm at odd angles and looked at it in the mirror, etc. I remember somewhere hearing that there’s debate about where the nails actually would be placed–in the palm or the wrist… and if his arms were tied to the cross with ropes as is sometimes described… The hands are delicate and the bones and tendons would tear from the pressure and the weight. My hands are important to me, they are my livelihood. My fingers involuntarily clench into fists at just the thought of the pain. I looked at many examples in painting and sculpture before I began. I decided that at age 30, a carpenter wouldn’t be a skinny, wimpy guy. So I gave my Jesus well-muscled shoulders and chest. His legs are sturdy because he walked miles everyday. 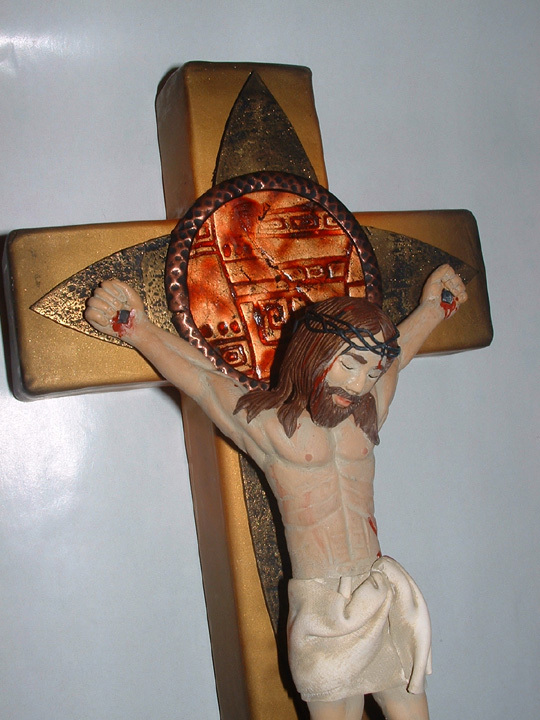 And I tried to sculpt a face that might be convincingly Hebrew, rather than a blonde, blue-eyed Jesus. But I struggled with all the questions and issues I imagine all artists have struggled with as we’ve dared to present the crucifixion. The consensus about many of those issues have become artistic conventions, not reality. For instance, we know Christ was stripped and the Roman’s didn’t make concessions to modesty or dignity. But we wrap his waist with a cloth. We know he was beaten and bruised, but we sculpt a smooth, whole body. I’m sure he was covered in dirt and blood everywhere, but we clean him up. Even as I followed those conventions in the sculptures I made, the reality was brought home to me. As I dabbed a little red paint here and there and smudged some gray for dirt, I knew better. I knew there should be cuts and blood and bruises all over his body. Of course, I didn’t want to make something gruesome and shocking to give my kids. 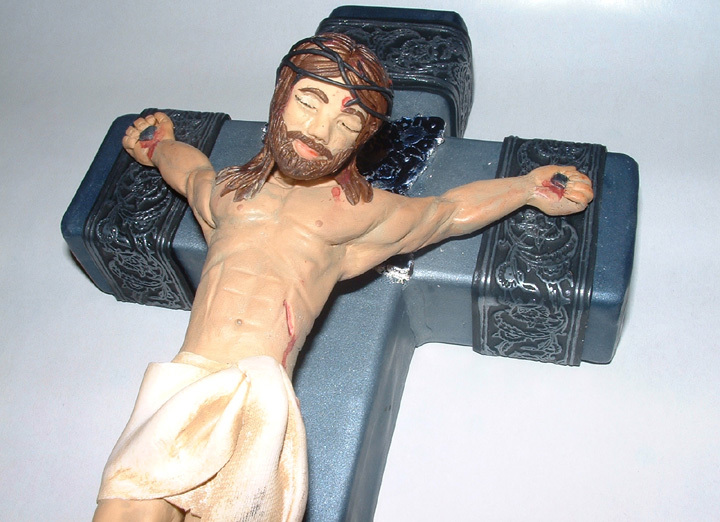 But isn’t the reality of our God becoming human and dying on a cross for us gruesome and shocking? It should be. Even today, as I look on any of those four crosses, I recall the experience of confronting the “cleaned up” conventions about Christ’s passion and trying to imagine the true reality. It was and still is humbling to recognize the depth of his pain and the breadth of his love that made him accept it. My wish is that you remember the depth and breadth of Our Lord’s love for you this week. Have a blessed Holy Week. Some of my close friends and my family know that I have an annual tradition of making my husband a handmade sweater every year for Christmas. It’s been going on for quite a while and word has even gotten out among his colleagues and our church family as whenever he is complimented (usually by a female) on his sweaters, he proudly gives me credit. I’ve been asked a lot lately how long my tradition has been going. I wasn’t even sure myself looking back when it started. We’ve been married for 25 years, but I know I didn’t start right away. I’ve made 19 sweaters and vests. I know the tradition started in 1994. I have a photo of my husband and myself on the occasion of my graduation from grad school with my Ph.D. in 1994. In the photo, he is holding our baby son and wearing the first sweater, a green, pale yellow, and black vest with a fair isle pattern round the waist. Wow! Most of the sweaters are original designs I created without a pattern. The few times I follow a pattern, I interpret the term “follow” quite loosely. 18 of the sweaters are knitted. Only this year, the vertical wavy stripe pullover is crocheted. Most are wool or cotton and a few are even a silk blend. I usually begin sometime in october or november. Some years, the sweater might have been a few days or a week late. Most years, he’s worn it for NewYear’s at least. the 2012 sweater wasn’t finished until Valentines Day 2013 because I miscalculated the pattern and had to rip it out back to the armpits and go again. 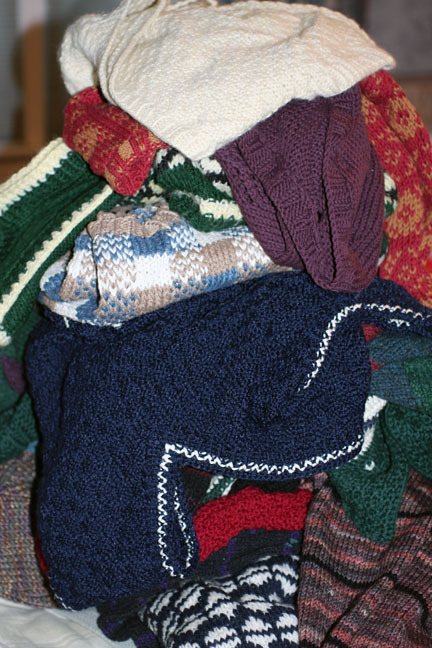 Kevin tentatively suggested that he might have enough sweaters and that perhaps, since my son’s are pretty much full grown, that I should make sweaters for them for a few years. We’ll have to see. 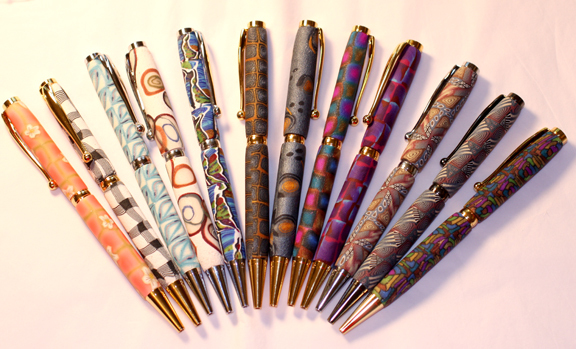 I made 18 pens yesterday! One of my galleries let me know they’d sold all their inventory and needed more. So I figured I’d make plenty to send to several galleries before the holiday season. These were lots of fun and I was able to make so many in a day as these were using up bits of old canes. Many were just enough for one pen, or two. So I accomplished two things; inventory and some housecleaning of the cane drawer! Recognize any canes? A few are the leftover bits from the caning book. Many are leftovers from projects requested by Polyform Products. This year my husband and I celebrated our 25th Anniversary. And we did it in Italy!! My husband had been to Rome twice in the last 6 months and the first time, it nearly killed me that he saw the Vatican without me!! The second time, he took our daughter. The third time, it was my turn! We had a couple days in Rome, a couple days in Florence, and we spent two days driving through Tuscany looking for wineries! Make sure you have a GPS and charged batteries!! It was a fabulous trip. 25+ years ago, as a student in many, many art history courses, I’d never have dreamed I’d see those sites and works in person. 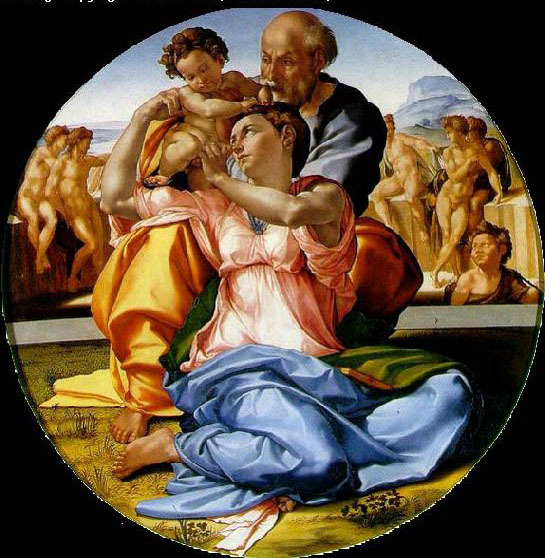 My favorites were the Cathedral in Florence, and a small painting of Michaelangelo’s Madonna and Child with St. Joseph. Any parents who’ve had toddlers can recognize this real human struggle–the classic hand-off from one parent to the other when the mom or child have had enough of each other! And how often did it happen in church–at least in my time! So I promised I’d be back soon and show you some of my artwork. 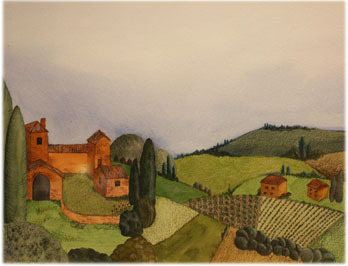 Here’s a painting I did this summer from one of my photos near Montepulciano. It’s a watercolor done in the style of Grant Wood and is now hanging in my dining room. Here’s to fabulous travels! And have a great holiday weekend. So what have I been up to? Artwork of course. And this summer, while it’s been very dry, we are having an exceptional fruit harvest. I live on an acreage. We’ve been here 11 years. When we bought the place, there were several old and mostly dead apple trees and a pear tree and a cherry tree that didn’t have a pollinator, and thus never bore cherries. My husband cut down everything but the old pear tree. Then we started over to establish the orchard of my dreams. It’s been slow, as some years we planted one or two new trees and they didn’t survive so we had to replant before different fruits were established in my orchard. Then, as the trees became large enough to produce fruit, we’ve had 3 bad years with late spring freezes that have zapped the blossoms. This spring was a perfect spring for the fruit trees. 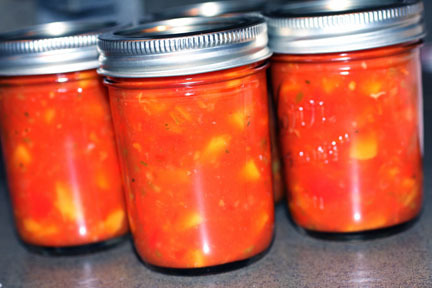 In July, my daughter and I picked sour cherries and froze them for pies, canned them for preserves, and made chutney. 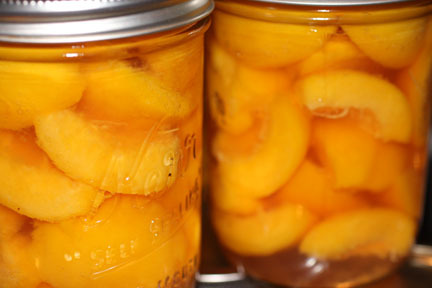 Yesterday, I took every peach off my small peach tree as they were ripe and the bugs discovered them. Fruit, to me is just such an example of God’s benevolence. Sweet, tart, bright colored, it makes me smile. A stack of jars is a thing of beauty. It’s not my usual artwork, but it is Art. The apples are ready, but thankfully, they are more patient, waiting on the tree for their turn. 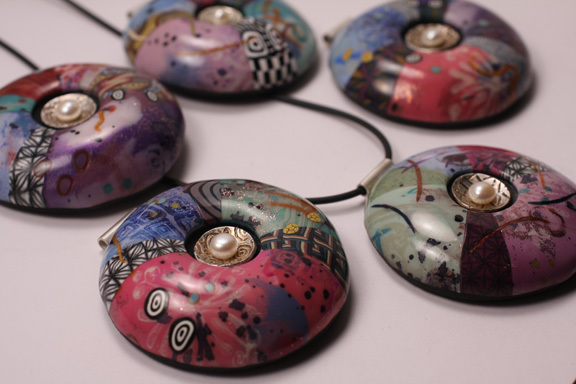 At the Bead and Button Show, or in any class I teach, I like to tell stories while I’m demonstrating. I talk about my experiences, my work and where it comes from, as well as funny things that have happened in my family related to my art over the past 20+ years. Often when I teach classes using my collection of leaf molds, I tell what kind of leaf it is, where it came from, etc. One of my favorite leaves are rose leaves like the ones in the two pins shown here. 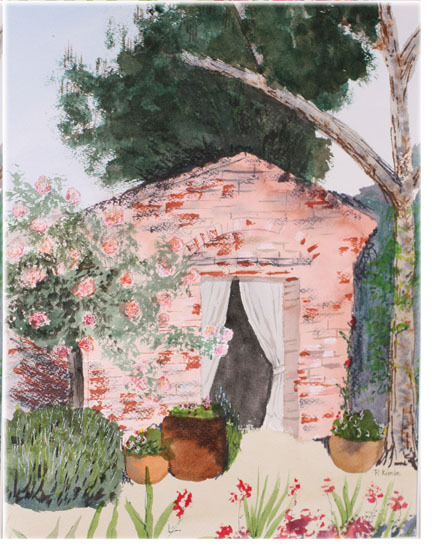 When my husband and I were visiting a winery in Greve, Italy on our recent trip to Italy celebrating our 25th anniversary, I noticed a miniature rose bush in the landscaping. I picked one tiny leaf and tucked it into my wallet to mold it when I got home. I haven’t had time to make anything with the mold yet, but it will make a great story, don’t you agree? Now, for the lesson on the importance of the story: one of the students in my stamp store class listened to the story and at the end of class, bought one of my samples that was made with the marigold mold. She was touched by the story and it increased my sales. AND…the next month, I was teaching a different technique, but again using leaf molds. That student re-told the story for me to another woman who hadn’t attended the previous class. And I made another sale of a sample made with that mold! 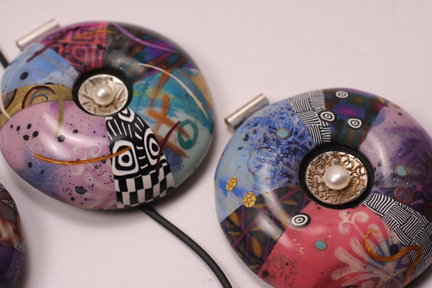 When you make things for friends and family, share the story with them about making the piece along with the gift. If you sell some of your work, perhaps at a craft show, tell your stories. If you sell through a local shop, make sure to get to know the sales personnel so that they can talk about you and your work. And think about creative ways to include your stories on hang tags or other marketing pieces. When you clay with kids, show them how to express a story through their work. It will open a new world to a child. Our stories are what make art meaningful and desirable. I love pearls. I use many colors of dyed pearls in my leaf series of silver earrings and pendants. 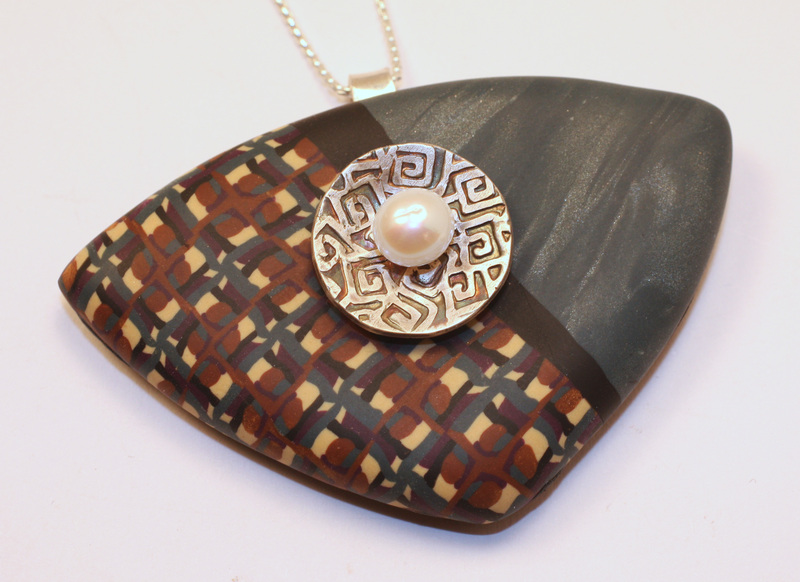 But I haven’t used pearls often with polymer. 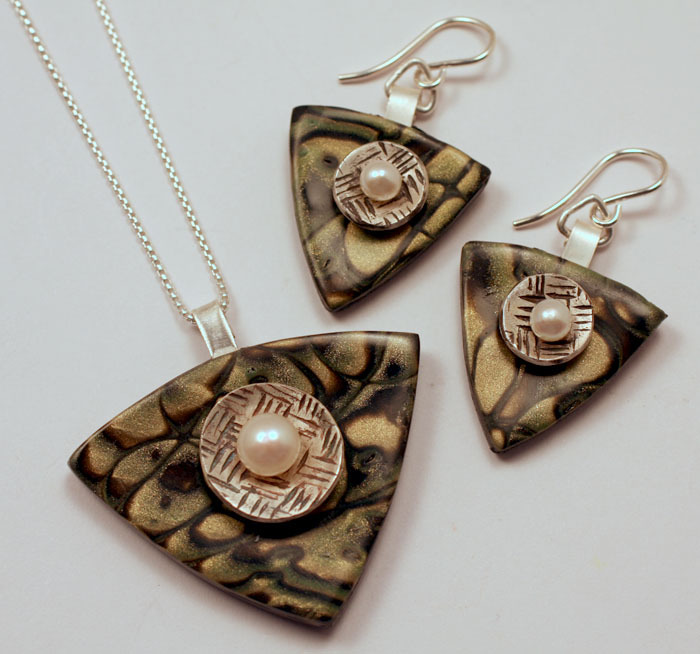 I have been doing a fun design with pearls set on a post and backed with a concave disc of silver. I’ve been exploring this design element from several directions. First came a series of designs using a cane pattern and a contrasting solid. I’ve done a dozen or so of these and each pattern and shape combination is different. So they are each one of a kinds. Finally, I wanted to take the design into deeper complexity and pieces with a bigger Presence. These are each about 2-1/2″ in diameter, so they have presence alright! I started with 4 color mixed sheets that I painted, stamped, sprinkled with glitter, dripped with ink, and even drew on with metallic markers. Those sheets were covered with a thin sheet of translucent. Those four sheets were cut up for the major spaces of these donuts, and interspersed with canework patterns. Finally, I added floating cane slices or carved and back filled. 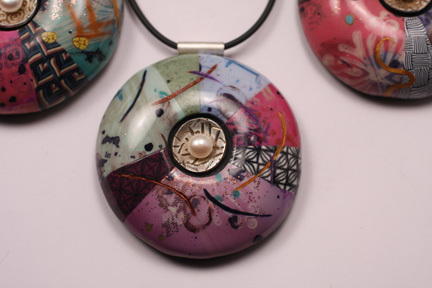 The pearl is mounted on a wire that is soldered to the portion of the bail that’s hidden inside the layers of clay. So there you have it. Same design concept applied in different forms.